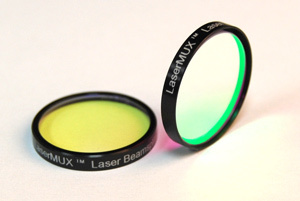 ROCHESTER, N.Y. – Semrock Inc., the leader in optical filters for biotech & analytical instrumentation, has launched its new line of LaserMUX™ optical filters, designed to efficiently combine or separate multiple laser beams. These new laser dichroic beam combiners have been optimized to multiplex (MUX) sixteen popular laser lines, and can also be used in reverse to demultiplex (DEMUX). The ultralow-autofluorescence filters are ideally suited for OEM multi-laser fluorescence imaging and measurement applications including laser microscopy and flow cytometry, as well as for myriad end-user applications in a laboratory environment. LaserMUX dichroics are designed for the most popular fluorescence excitation lasers. The initial product launch includes six different filters for the nominal 405 nm, 440 nm, 488 nm, 514 nm, 561 nm, and 635 nm wavelengths. These filters are designed for flexibility – for example the 635, 561 and 514 nm filters can be used to MUX together either 514.5 or 532 nm, and either 561.4 or 594.1 nm, and either 632.8 or 647.1 nm, and either 671 or 785 nm laser wavelengths simultaneously. The filters are used at 45 degrees incidence while maintaining a high degree of polarization insensitivity. And the flatness ensures that there is less than one Rayleigh range of focal shift across a 2.5 mm beam diameter. "These filters are a response to strong market demand", says Dr. Turan Erdogan, CTO of Semrock. "More and more fluorescence applications are relying upon laser excitation, and these new filters are designed from the ground up to meet that need. But we believe that they will find broad acceptance for a wide range of laser applications." The LaserMUX filters come in an industry-standard 25 mm diameter (3.5 mm thick) metal housing with a generous 22 mm clear aperture. Rapid custom-sizing is typically available in under a week. A 30-day return policy on the standard components eliminates any uncertainty. Semrock manufactures and stocks a broad range of hard-coated catalog products for Raman spectroscopy and laser systems, and fluorescence microscopy and instrumentation. Catalog products ordered by noon, EST will be shipped same-day. Rapid custom-sizing is shipped in under a week and a 30-day no-hassle return policy applies to all catalog products. All Semrock filters are covered under the company's five-year warranty. Semrock manufactures a wide range of quality optical filters that set the standard in performance and reliability for the biotech and analytical instrumentation markets. All Semrock optical filters are made with hard Ion Beam Sputtered optical coatings. OEM filters are manufactured in volume. End-users benefit from a wide selection of standard catalog products that ship from stock. Semrock's patented and patent-pending products include the highly acclaimed BrightLine series of fluorescence filters for research and clinical microscopy, high-throughput screening, real-time PCR, and other fluorescence-based instrumentation; state-of-the-art filters for Raman spectroscopy; and other unique laser analytical instrumentation filters. Semrock's innovative products, made possible by combining modern ion-beam sputtering with Semrock's proprietary volume manufacturing technology, are covered under an industry-leading five-year warranty. Founded in September 2000, Semrock is based in Rochester, New York, a well-known center of optics, and has sales offices throughout the United States. For additional information about Semrock, its products, and its team of international distributors, visit the company website at www.semrock.com. BrightLine, RazorEdge, MaxLine, StopLine and Semrock are registered trademarks, and LaserMUX and EdgeBasic are trademarks of Semrock, Inc.